Our water lubricated oilless screw air compressor is a good display of our pursuing for energy-saving, cleanness and environment-friendliness. We ensure that all our oilless screw compressor parts are of oil-free design. The following will describe for you the oil-free designs of our air compressor in detail. High-efficiency cooler can ensure our water lubricated air compressor work properly at a temperature of 50℃. 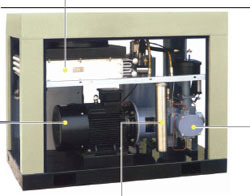 Water lubricated oilless screw air compressor is the true oil free compressor since all processes are lubricated by water. Meanwhile, the sealing and cooling are also achieved by water. The stainless air end housing, stainless rotor and wearing resistant oilless silicone carbide sliding bearing, etc. are designed with a lifespan of 25 years. Those oil-free air compressor components ensure the compressed air is totally oil free. 2. Non-standard environment: low temperature, sea water corrosion, tropics, high temperature, dust etc. 3. Non-standard gas: nitrogen compression, booster compression within 50 bars. 4. Non-standard pressure: blew 40 bars. 1. Inlet pressure 1bar (14.5psig).